Woke up to a gray, cool windy autumn day. “Perfect!” I’m thinking. I can finally get at the farm books!!! Got the kitchen table all set up, the coffee on and before I settled into anything, being the responsible rancher wife that I am……I headed out to the fields to check on our bulls and a few cows and the horses who are all on the home quarters here with me. Gasp….all I found were the horses and two bulls in the field where they are ALL supposed to be. That would be 11 bulls, two cows, two heifers and two calves. Oh lookee here! A broken down fenceline on one side of the field! and a decimated/demolished gate on the other side! 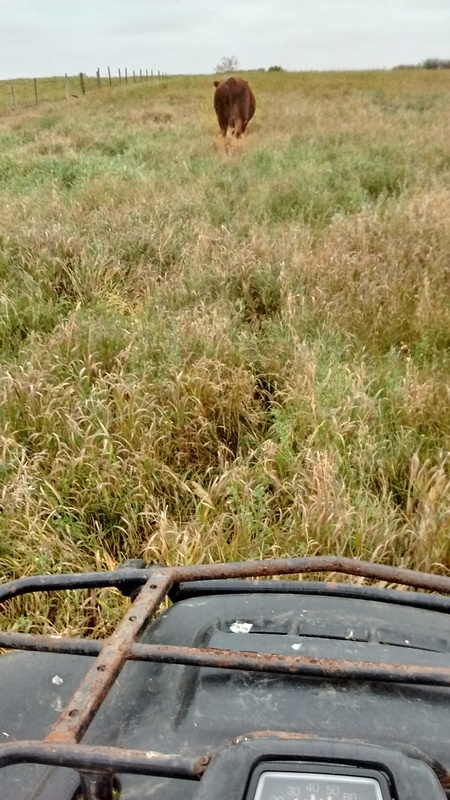 So I take to the search on my quad through our other fields and can’t find them until the farthest field – the one we brought them out of many weeks ago. Most of them are all back there peacefully sitting together by the slough just happy as can be. But by my count…not everyone is here! Back to the search to find, in yet another field, pacing the fenceline, on the wrong side of the fence, a lonely bull, one of our newest ones, anxious to find his buddies and brothers. Patched up the holes as best I could with my trusty wire stretchers, hammer and staples…locked up the critters where I can find them….and….the morning is gone! Is it any wonder why then, that the farm books generally end up getting done into the midnight hours?